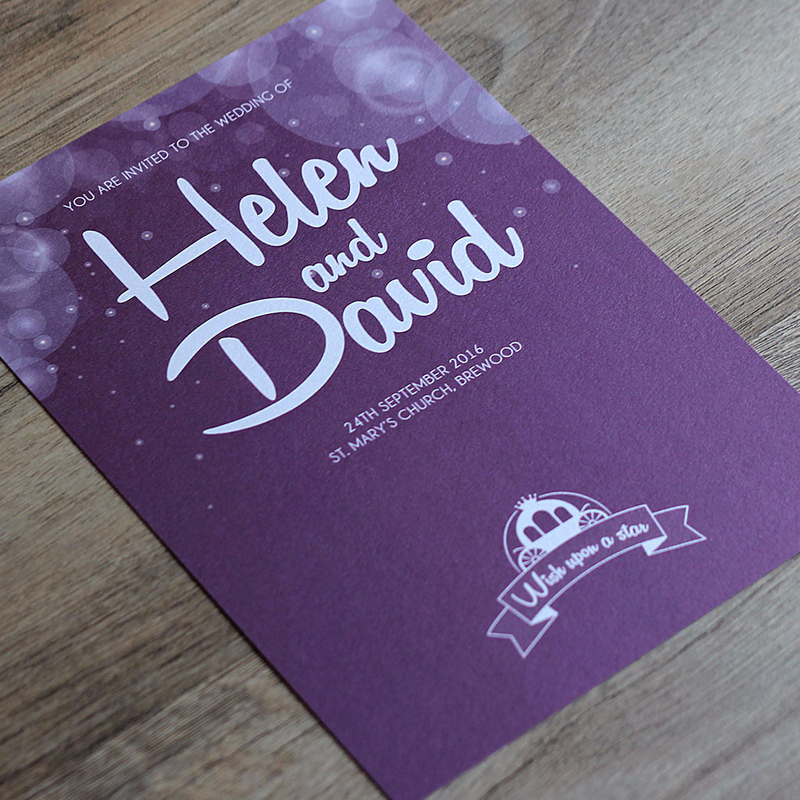 Immerse your guests into a world of magic and wonder from the very beginning of your wedding with this unique and enchanting wedding invitation from The Pretty in Print Company. Every little girl’s dream is to have a wedding fit for a princess, and you can make all your dreams come true with this beautiful design, aptly named ‘Enchanted Fairytale’… your 5-year-old-self would be bursting with excitement right now! This design takes on a Disney theme so it’ll come as no surprise that the A5 card is made from gorgeous Ice Silver metallic card for that all important shimmer and sparkle! The sheer quality is evident throughout; the weight of the 300gsm card teamed with the professional print finish ensures everything looks and feels suitably luxurious. The crisp finish on the whiter-than-white Disney style font pops from behind your colour of choice, so whether you’re looking to go all-out princess pink or you’re opting for an ‘under the sea’ turquoise, your finished design will arrive to your guests looking as though it’s straight off a Disney film set! On the reverse of their invitation, your guests will find information about the venue, reception details and any other information you wish to include; to make things even easier for you and your guests, a cut-off RSVP postcard is also included! Romantic, fun and charming, the Enchanted Fairytale wedding invitation is a lovely modern twist to the traditional wedding stationery options out there and of course, it’s without doubt fit for a Princess and her Prince!